If you love a mismatched table and chair, linen table cloths and pretty china wear, Café Katulki, is a great place to visit. The surroundings may seem quaint but the cafe is actually quite large and can accommodate lots of guests. 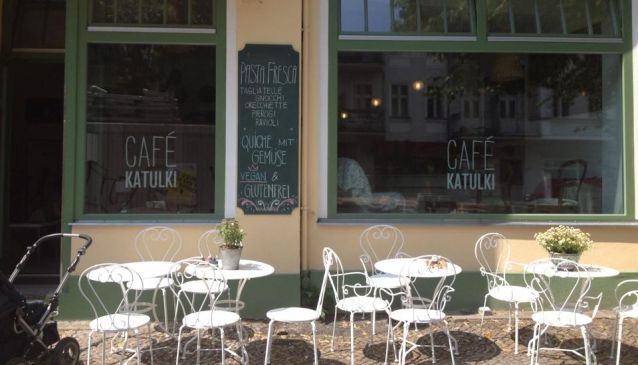 A mix of polish and italian, just like the two owners, Cafe Katulki, located just around the corner from the Maybachufer is the perfect place for a coffee or a bite to eat before exploring the area. Order yourself a brunch or sweet treats that are baked fresh in the kitchen out the back. There's a subtle kids corner, outdoor seatingfor when it's warm, lots of good coffee and a nice tea selection on offer. They also cater to the vegan and vegetarian out there, with yummy lunch options and sweet treats too!